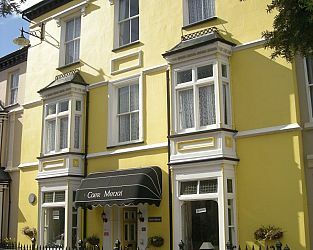 Caer Menai is a 4 star Visit Wales graded guest house situated in the heart of the Royal Borough of Caernarfon within the Medieval Town Walls. Offering 7 comfortable and individual en-suite rooms our house still retains many of its original features. We have the spectacular beauty of North Wales on our doorstep as well as the magnificent Caernarfon Castle just a few minutes walk away. Visit Caernarfon Gwynedd and the surrounding villages and stay in b and b, hotel or self catering cottage accommodation provided by BedPosts members. CAERNARFON is dominated by a superb castle with 13-towers. Caernarfon is located at the estuary of the Afon Seiont (Saint River) and the western end of the Menai Strait. Part of Edward 1's iron ring, the castle is arguably the most imposing. Started in 1283 on the site of a motte-and-bailey castle, it would later be adopted as a royal palace, designed to be a symbol of the Crown's dominion over the Welsh. The huge and intact polygonal towers and ramparts are a sught to behold. The Royal Family chose it for Prince Charles' investiture as Prince of Wales - some 7 centuries after the first English Prince of Wales was invested there. Caernarfon castle contains the regimental Museum of the Royal Welsh Fusiliers. Medieval walls with towered gates starting from the castle go round the old town. There are many interesting buildings in the narrow streets including some Georgian and Victorian; a few, including St Mary's Church, are older still. A town trail leaflet can guide you from the Castle Square, through the old gates, around the old red-light district of Northgate (having the 15th-century Black Boy inn) the castle and the old Slate Quay. Caernafon was a seafaring town and this fact is illustrated by the displays at Maritime Museum on Bank Quay near Victoria Dock. Caernarfon's history began many hundreds of years before the Normans invasion. The Roman conquest of the area was in AD 77; following this they built a fort called Segontium in the southeast of the town. Segontium had defences made of timber and earth, together with gates and parallel streets. At its peak it housed 1000 troops, all non-Roman citizens called cohorts. Romans occupied Segontium until about AD 394. If you seek accommodation near Caernarfon in Gwynedd you have come to the website of a “club” of providers who offer affordable quality accommodation around UK in hotels, bed and breakfasts, guesthouses, inns, and restaurants plus self-catering cottages and apartments .